SARDAA Team photograph taken September 9/18 – dogs in front (l to r) Twang, Shado, BB, Che, Ivy; front row (l to r) – Maryann and Yoyo, Paula, Steve and Zoeker, Mark, Kim and Remmy, David, Jenna, Jen and Sohke, Pam and Sophie, Meighan and Chase, Elisa and PaCe, Michelle and Parquetta; back row (l tor) – Lucy and Molly, Jennifer and Tango, Ron, Sam, Zara and Cinder. Unavailable for the photo that day – Kate and Jenga, Lisa and Zane and Zero, Carlene and Jake and Milo, Mike and Kaya, Kerrie, Dawn, Don, Cara, Anita, Carla and Roo. 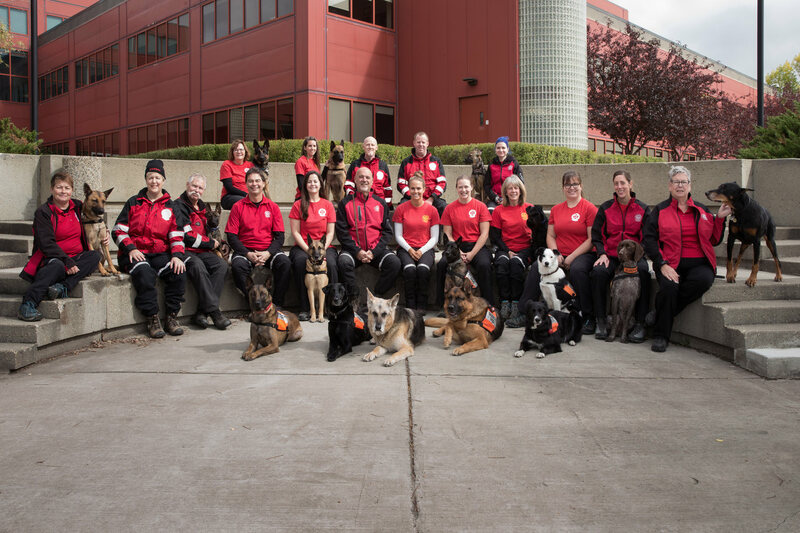 Established in 1989, SARDAA is a volunteer, non-profit group of dogs and handlers who serve the community in times of emergency or disaster. SARDAA is a registered charitable organization. Sorry, we DO NOT search for missing pets. Read the latest SARDAA Newsletter!